Reminiscent of a bygone era, the molded edges and subtle curves of the Devonshire pedestal add distinctive visual impact to your bathroom design. Combine this pedestal with a Devonshire basin for a classic collection. Combines with the K-2295 or K-2287 basin to create the K-2294 or K-2286 Devonshire pedestal sink. Turn on the turn-of-the-century charm. This pedestal sink from our Portsmouth Collection features exquisite details that make it ideal for a traditional bathroom. Plus, its ergonomic Right Height design helps prevent back strain. Made from high-gloss, stain-resistant vitreous china. Available with 4 in. or 8 in. center faucet holes. 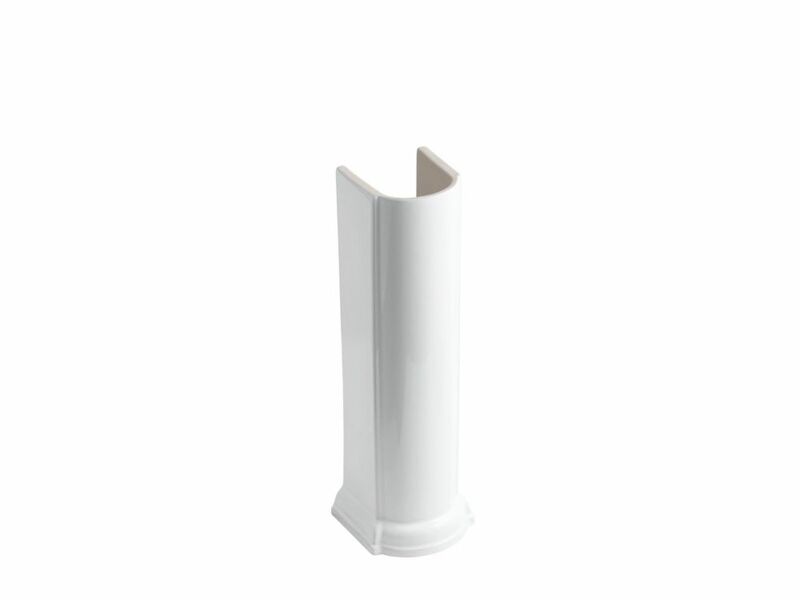 Reminiscent of the Art Deco Era, the Series 1930 Pedestal Lavatory brings form and sophistication to any bathroom. Its overall clean lines and period signature stair step design makes this pedestal lavatory a classy choice. 8 in. lavatory sink sold separately. Archer offers a timeless appeal, blending subtle elements of Craftsman woodworking techniques and the intricate facets of jewelry. Distinguished by its beveled edges and clean geometry, the Archer pedestal creates a universal look that suits an array of bathroom styles. Pair it with an Archer basin for a brilliant overall effect. Beautifully detailed, the Devonshire Suite captures the essence of old-world elegance. The simple yet striking combination of curves and design lines adds refinement and distinctive visual impact to bath and powder rooms. The Devonshire pedestal is crafted of durable vitreous china finished with our exclusive KOHLER glaze to resist staining, scratching and chipping and maintain its beauty and sheen for years to come. Also available in store by special order only see store for details. Devonshire Pedestal Only In White Reminiscent of a bygone era, the molded edges and subtle curves of the Devonshire pedestal add distinctive visual impact to your bathroom design. Combine this pedestal with a Devonshire basin for a classic collection. Devonshire Pedestal Only In White is rated 4.5 out of 5 by 2. Rated 4 out of 5 by fess from good product for the price excellent service. product arrived in three days. free shipping. excellent price and very nice looking. I would recommend home depot to every body.